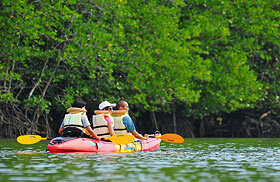 Sightseeing Koh Yao Noi Enjoy a day of scenic sightseeing around Koh Yao Noi, the smaller sister island of Koh Yao Yai. 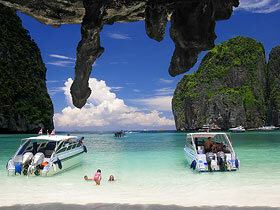 Arrive by long tail boat and admire the beaches and views of Hong Island archipelago in Krabi along the way. 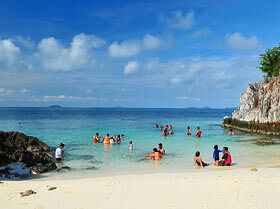 Kohyao Yai Traditional Island Life Exploring around the island by Po Tong seems like a traveling back in time. 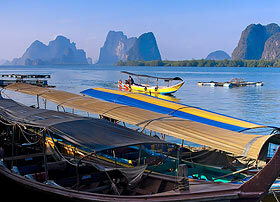 Come on a journey with us to experience the local customs and traditions of the warm and friendly people of Koh Yao Yai. A tour guide will show you the many exciting and interesting places to experience the island way of life. 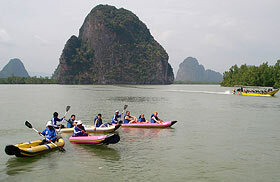 Island tour Explore the natural wonders of Phang-Nga Bay with a day trip of sightseeing and sea canoeing. 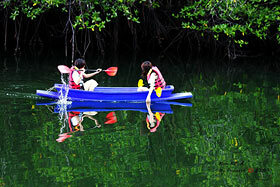 Sail through mangrove to James Bond Island, visit the floating village and canoeing through the caves and limestone formations. Visit the local community. 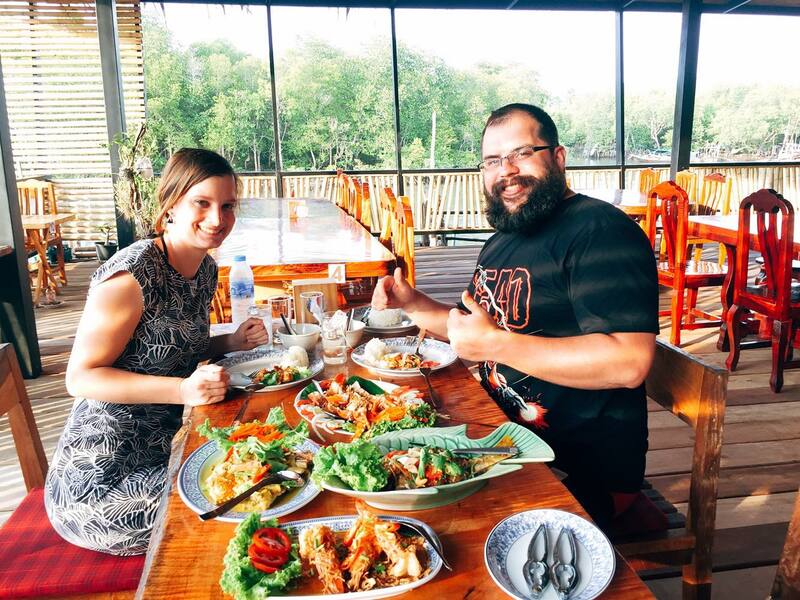 Visit the local fish farm (Common known as Krachang by local name) where the fishes and lobsters grown up here And send to restaurant around tourist beaches area in Phuket. Kasem Nilsamut with a puffer fish. 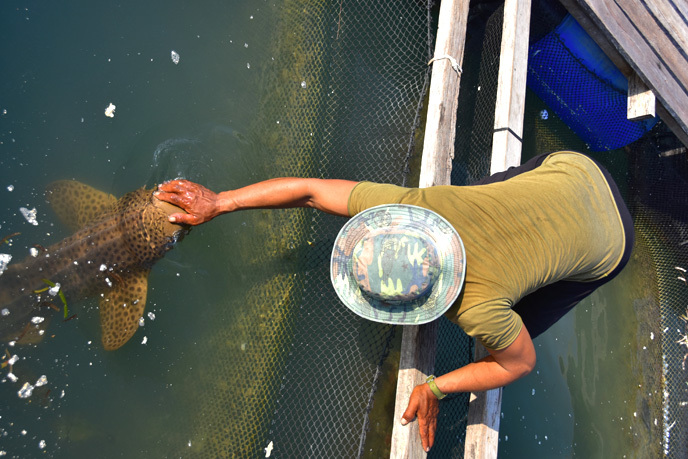 His fish farm has a number of interesting creatures, such as leopard sharks, puffers, spadenose sharks and lobsters. 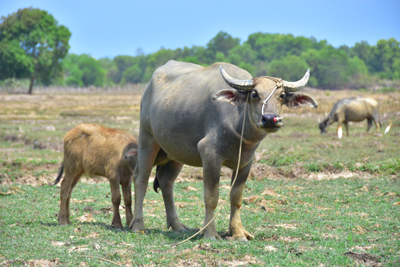 Rubber tree farming is the most important agriculture, and one of the main incomes of the people on Koh Yao Yai. Observe a rubber tapping demonstration and the agriculturist's lifestyle which is simple and in tune with nature. The lush rice paddies of Koh Yao Yai not only look beautiful but are a vital part of rural island life. 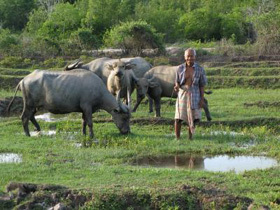 The rice provides an income and helps the islanders live a self-sufficient lifestyle. 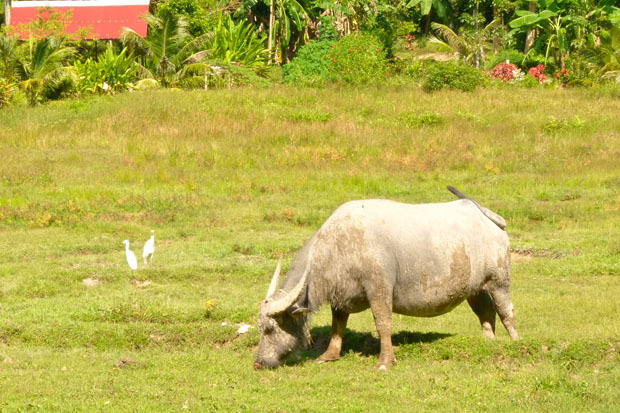 Enjoy the scenery of green fields, farmers and the water buffalos as we pass them by on the tour. 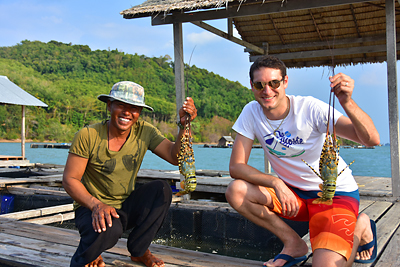 Visit a lobster farm floating on the sea, learn the process of lobster feeding demonstrated by the local fisherman and enjoy taking photos with the colorful lobsters. Discover the traditional way of life of the locals despite growing tourism, proving that the two can exist together in harmony without compromising the laid back rural lifestyle. Explore the mangrove forest and take a nature walk to a spectacular view point home to the Hornbill, where you might be lucky enough to see them. Visit the Batik Painting Center where you can buy handicraft products and souvenirs. 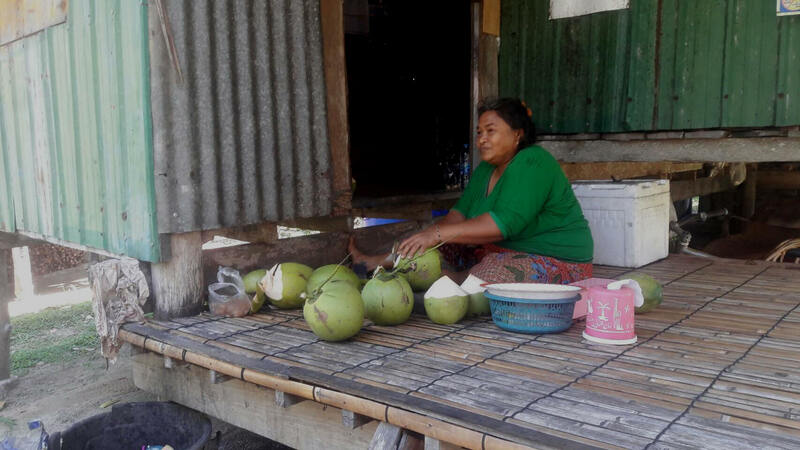 We will take you to visit a typical local house where people live in harmony with the natural surroundings of the rice fields and drink some fresh coconut juice picked from the coconut tree. 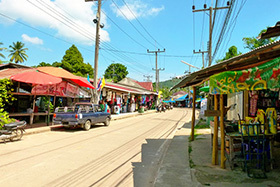 Enjoy shopping at down town market; observe the local way of life, souvenirs and the local food and snacks. 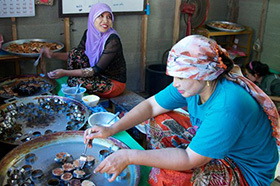 Visit the Batik Painting Center where you can buy handicraft products and souvenirs. 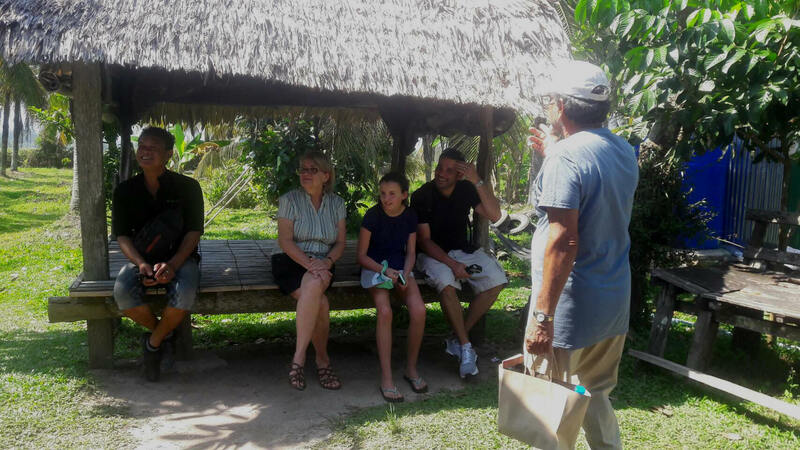 We will take you to visit a typical local house where people live in harmony with the natural surroundings of the rice fields and drink some fresh coconut juice picked from the coconut tree. 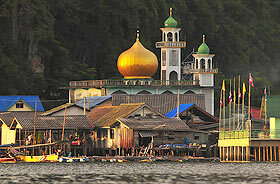 to experience the local way of life on Koh Yao Yai. 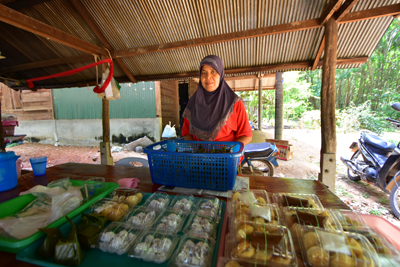 and learn how the islanders make a living while meeting the warm and friendly locals. mask & snorkel, lift jacket and national park fee. mask & snorkeling, lift jacket and National Park fee. 08:30 Pick up from resort. Welcome on board. Prepare equipment. 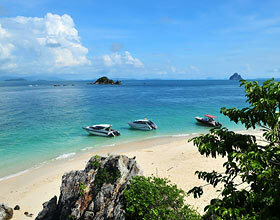 09:10 Arrive at Koh Lao Hang or Koh Deang for the first fun dive. 10:00 Relax on board. Fruit and soft drinks served. 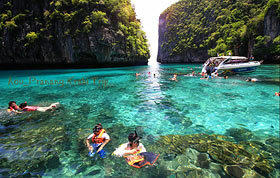 11:20 Arrive at Koh Hong, the most beautiful island around here. 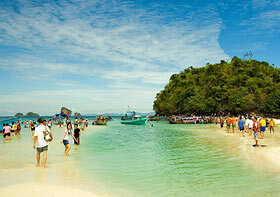 the archipelago and the fantastic views of Phang Nga Bay and Krabi. 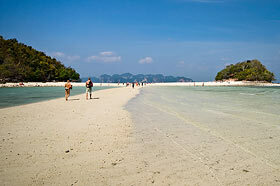 Many new areas have been developed on the islands surrounding Kho Yao Noi and on the northern end of the Island itself. 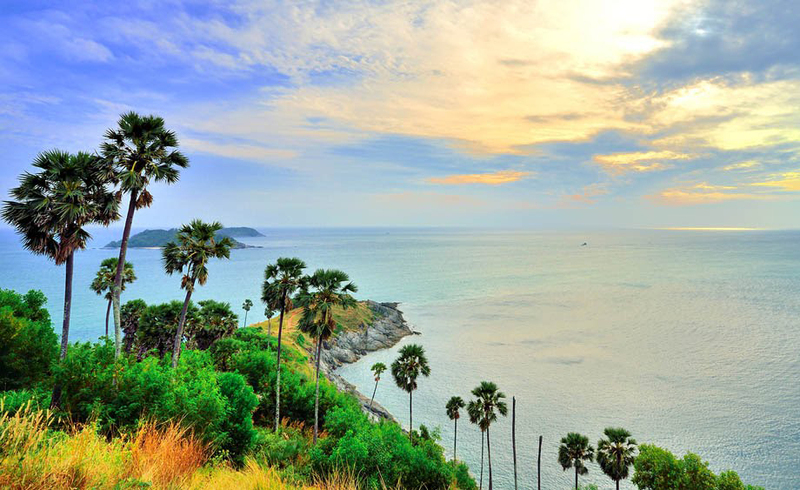 This is one of the most low key and tranquil island destinations in Thailand and now hosts many new climbing areas as well. 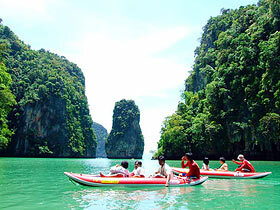 Located in the southern end of the Phang Nga bay. The beauty surrounding this island is breath taking. 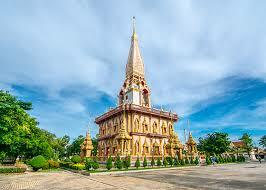 However don't expect the ease of Tonsai/Railey. 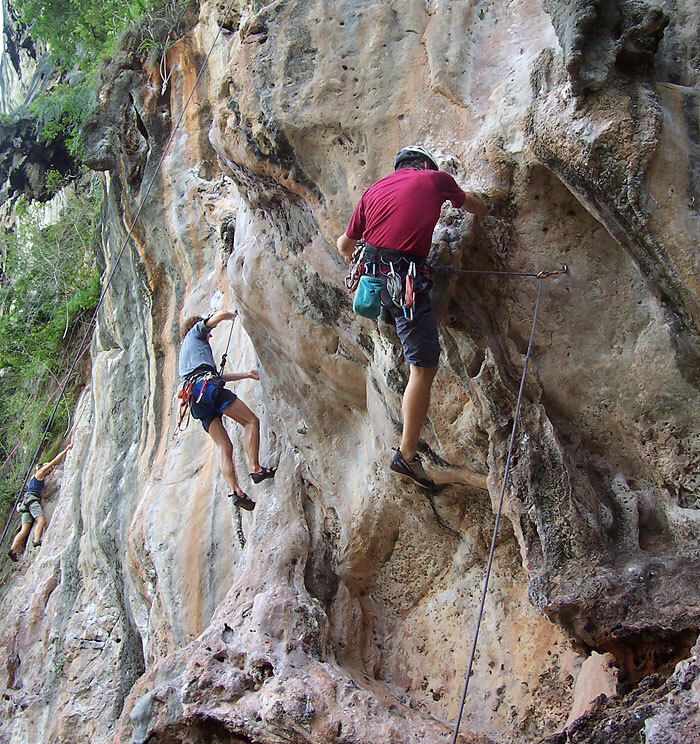 Approaches require motor bike rides through steep jungle roads, hiking and or hiring a boat.The climbing logistics can be difficult to sort out, but you will be rewarded with high quality Titanium bolted routes in a peaceful setting. For all bookings of day tours operated by Kohyao Travel , a minimum of 24 hours’ notice of cancellation prior to your scheduled tour departure is required for a full refund. If a cancellation is made with less than 24 hours’ notice prior to departure no refund is given. No refund will be given if tours are canceled with less than 48 hours’ notice, as Kohyao Travel will be charged for all costs such as guides, transport etc. You will be refunded 50% of the total tour / Transfer price. 50% is non-refundable, as this represents our direct cost of canceling any arrangements made for your tour. 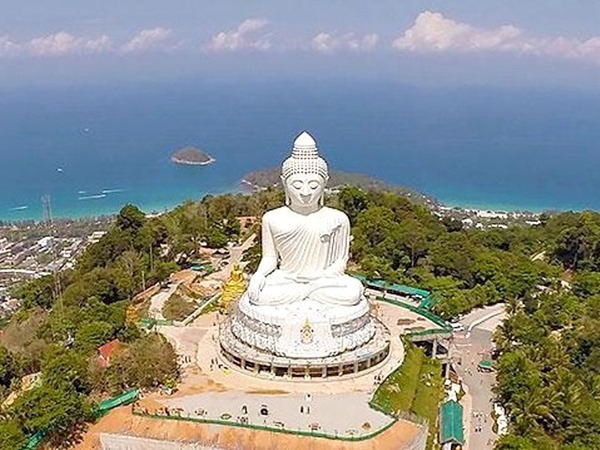 No refund will be given if tours and Transfer are canceled with less than 8 weeks notice, as Koh Yao Travel will be charged for all costs such as guides, transport etc.